Heavy riot is ongoing in the Maitama area of Abuja, the Nigerian capital. Transcorps Hilton area of Abuja in Maitama is on fire as Shiite Muslims clash violently with the police. It was gathered that the riot broke out after protesting Shiite group clashed with some security agents. The group is protesting the release of its leader, El-zakzaky who has been in custody of the DSS. According to an eyewitness, the visibly enraged Shiite members were seen throwing stones and sticks an armoured tank mobilized to the protest scene. They were several attempts by the protesters to break into the armoured vehicle. 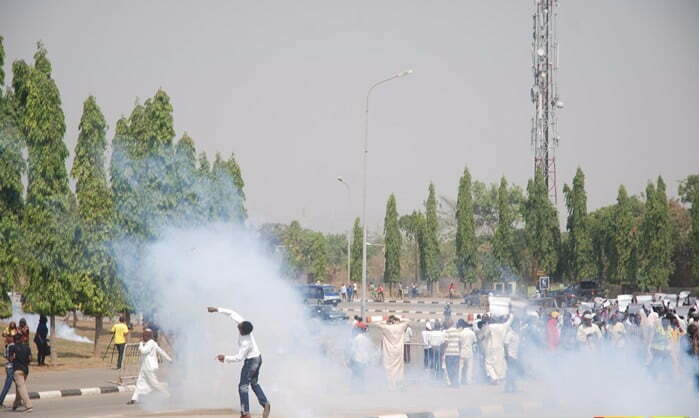 The Shiites member were not moved by the teargas continuously fired by security agents to disperse them. protesters at the Unity Fountain, beside Transcorp hotel. The Shi’ite group have been protesting since Thursday on the streets of Abuja. Meanwhile, residents have been advised to avoid major roads in Maitama and Wuse area of the Federal Capital Territory. To Release an armed bandit? Freedom of expression is free! !